Chickadee eating sunflower seeds from a coconut bird feeder set under the eaves. Here’s how to make two natural coconut bird feeders that will blend in with any garden landscape. You can fill either with a variety of foods for the birds. Mixed bird seed in this simple coconut feeder attracted the bright little goldfinch, shown far right, within minutes of being set out in the yard. A pair of bluejays, with one shown here, dropped in for lunch the next day, along with sparrows and chickadees. The second design (see photo, above, and directions further down the page), has a natural roof to keep the food somewhat protected from rain and snow. If you set it under the eaves of a house during winter, it protects the food from the elements and, for me, so far, has NOT attracted the squirrels. If you’d like to attract orioles, use our recipe for oriole nectar but tempt them further by filling the bowl of a coconut feeder with half an orange, some cherries or banana chunks, nuts or suet. If the fruit is very ripe, you may also attract some butterflies to share the bounty. 1. Do a Google search for ‘open a coconut’ and you’ll find step-by-step photos, or even videos, that will show you a variety of ways to do this. The first step is to pierce at least one of the three darker spots on one end of the coconut to drain out the coconut milk. After that, one method suggests using the blunt, non-chopping side of a cleaver, or a similar implement, to tap all around the center of the coconut until it cracks open; in this way, you should get two fairly even sides to use. You can also clamp the coconut in a bench vise (not so tightly that you crack it), then use a hack saw, or hand saw to cut it in half. 2. Drill three, equally spaced holes around the rim of the coconut. Thread a 24 inch length of twine through one of the holes, bringing the ends together evenly. Starting near the hole, begin twisting the two strings together to make a single cord and temporarily knot them together at the top. Repeat with the other two holes, then undo the original knots and knot all the strings permanently together at the end. Before you tighten the knot, make sure that all three strings are the same length so that the coconut will hang properly. 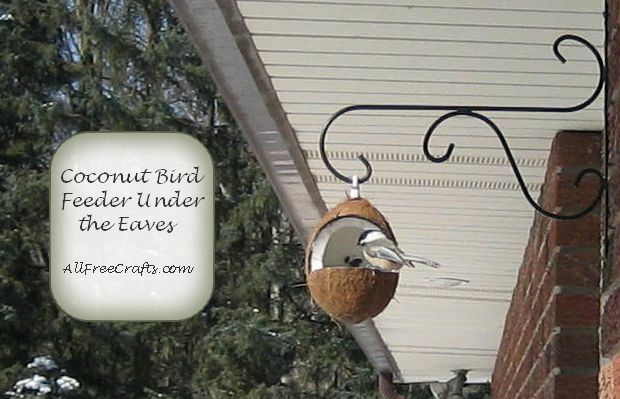 Use a hook, or a shower curtain ring, to suspend the coconut bird feeder from a tree or large shrub. Ours is suspended on the edge of a large stand of lilacs. In winter, it is moved to a hook under the eaves of the house, away from rain, snow and wind, and within sight of the kitchen window. Fill with bird seed and wait for the birds to find their new feeding station! After completing the half-a-coconut bird feeder shown above, an alternative design occurred to me. This is made by clamping the coconut sideways in a bench vise then cutting only halfway through it with a hand saw or hack saw. Remove the coconut from the vise and re-clamp it in an upright position so that you can make another cut at right angles to the first one. This makes a natural roof over the feeding area to keep the food dry and clean. Screw a cup hook in the top, or drill one hole through the top to thread a knotted string through as a hanger – and you’re done! Once the coconut is open, remove the coconut meat, if desired – but leave a little behind as many birds enjoy it.